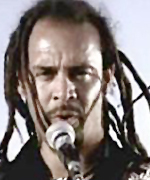 Human rights activist, musician and filmmaker Michael Franti believes that the world is still a place worth fighting for. On the eve of soccer's World Cup final game, the outspoken artist couldn't stress enough that his goal — through his music and film, I Know I'm Not Alone, which documents his travels to Iraq — is to educate the world about human suffering. "For some people, these are the first images that they've seen of what life is like for people living in the Middle East," comments Franti on the reaction of international audiences to his film. "It has been very moving and emotional for them." I Know I'm Not Alone, which was released on DVD in North America on Tuesday, follows Franti as he travels with his guitar around Iraq, Israel and Palestine meeting civilians and soldiers. "I have been an outspoken opponent to the war and I thought that in order to be the most effective in speaking against it, I should go there and see things for myself," says Franti, whose motivation to make the film also came from wondering what parents must tell their children while facing an imminent bomb threat. "What we're seeing in the media is a tiny controlled fraction of what's going on there." Franti didn't originally intend to make a film. The Spearhead leader took his video camera to Iraq to capture footage of his visit that he figured he could put on his website. But he soon felt an overwhelming obligation to show the rest of the world the Iraqi experience. What he found was a willingness to find peaceful solutions not only amongst Iraqi, Israeli and Palestinian civilians, but American soldiers as well. "The most amazing thing was seeing how people on all sides of the conflict have this amazing resilience and also have this willingness to find peace." But the experience was also a personal journey, as Franti says that one of his biggest challenges was "to see people who had been injured or blown up, and then to try to hold my heart open for the people who may have done it. I tried to hold my heart open for soldiers and tried to be as skilled a listener for them as I was for someone laying on their deathbed." Franti's drive to get across messages through his work comes from his belief that the U.S. is far from a perfect place, but that there's potential for positive change. "I think the responsibility of any artist is not to be political, not to be left or right," he says. "The responsibility of an artist is to make great art. And to make great art, you have to find some truth." Franti's truth was to show those in the Middle East that Americans aren't just soldiers who carry M16s and pose threats, but that they can be peaceful and loving people, too.